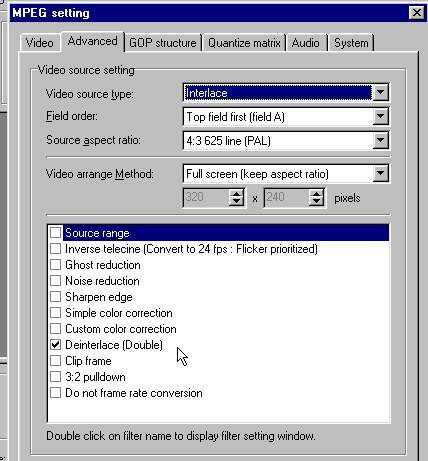 A simple comparison between TMPGEnc version "B12a" e "2.53"
In this test a short MJPEG movie is encoded to MPEG2 using the software TMPGEnc B12a(very old version) and TMPGEnc 2.53(last version). 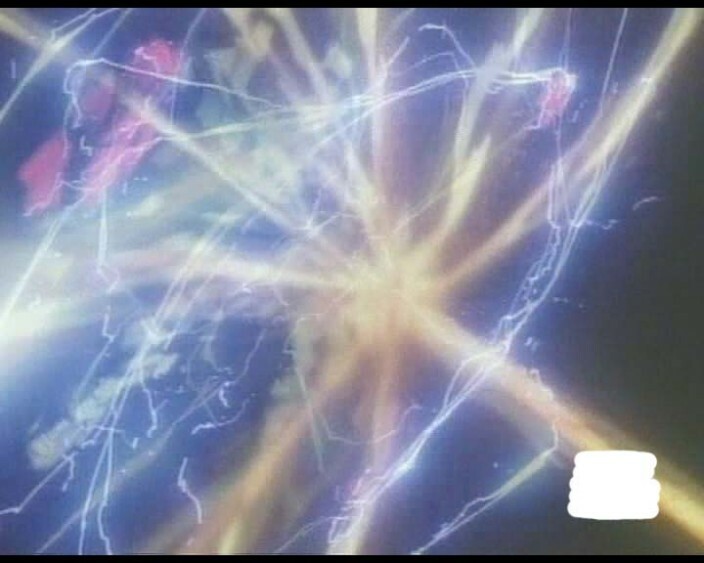 The test movie called "prova" is PAL 768x576 MJPEG interlaced, audio PCM 48khz stereo , 25ft/sec, total lenth 256 frames, 36,1 MB captured from TV. 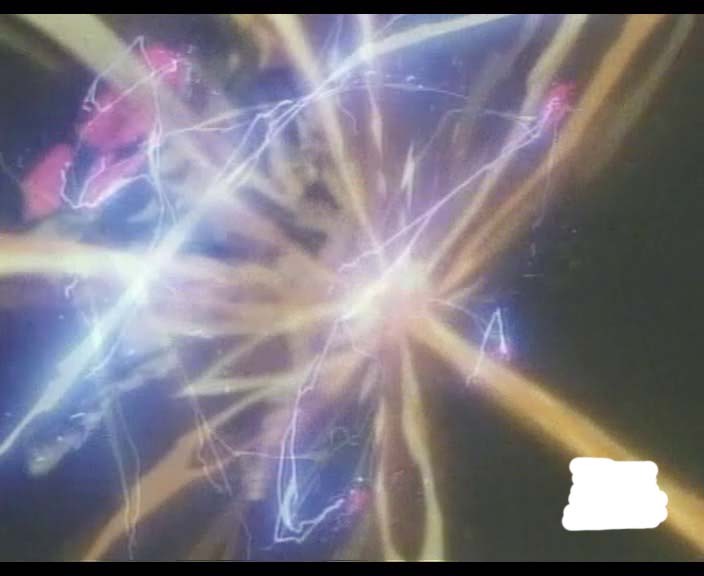 It contains particular scenes hard to encode, so in some frames MPEG2 encoders make artifacts. My computer(used for this test) is equipped with ATHLON TB 1400mhz, AK73a AOPEN motherboard, 256 MB pc133 sdram , graphic card ATI radeonVE dual display, capture card AV MASTER 2000.
as you can see the final movie will be MPEG2 deinterlaced 720x576 , encoded with CQ_VBR bitrate control=20 , Motion Search is set to Normal , audio is set to MPEG Layer2 224Kbits/sec 48khz stereo . the encoding parameters are the same of B12a , except for CQ_VBR quality set to 28 because in TMPGEnc 2.53 this parameter have a different value from that in TMPGEnc B12a. I've choosen this frame because it's hard to encode. 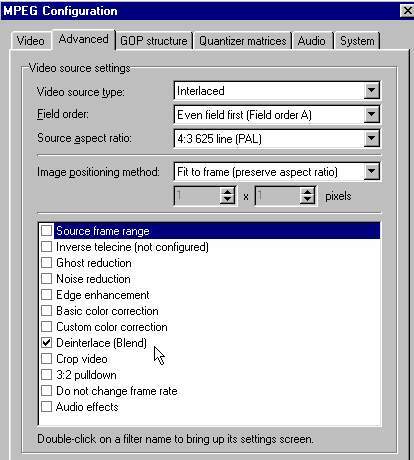 There are more artifacts in the frame encoded with TMPGEnc 2.53.
how can it be possible?Usually a high quality motion search gives a better encoding, but TMPGEnc 2.53 does the contrary. 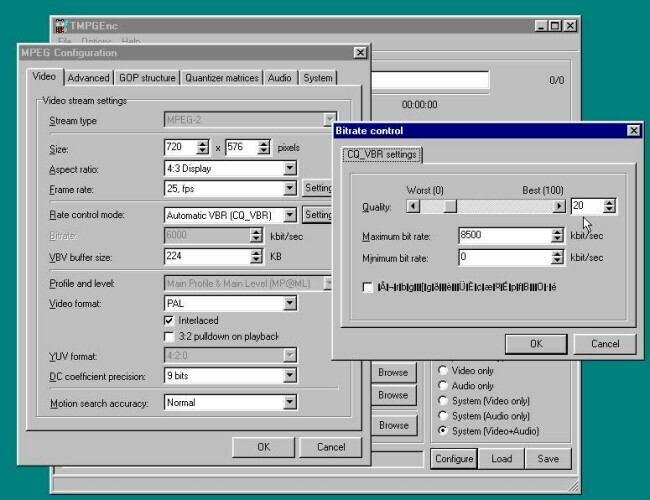 The DivX codec is set to "1-pass quality-based" , quality"93", use bidirectional encoding( B frames )"on".The performance of encoding is set to "slowler". 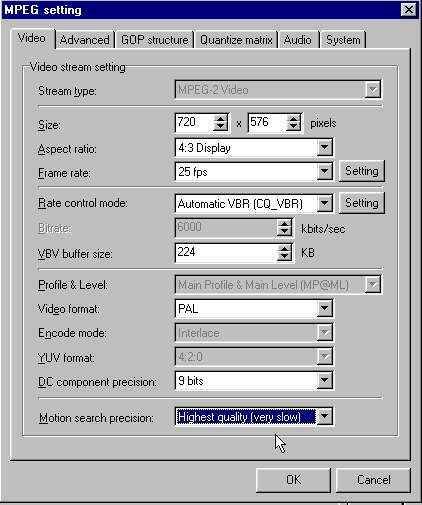 The movie size must be set to 704x576 , because many graphic cards have problems playing avi files whose width is not multiple of 32 pixels and 720 is not a multiple of 32. 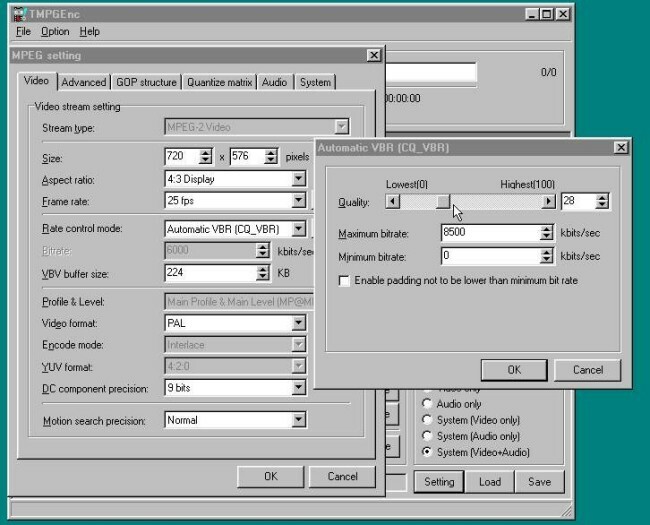 The audio is set to MPEG Layer3 128Kbits/sec 48khz stereo . 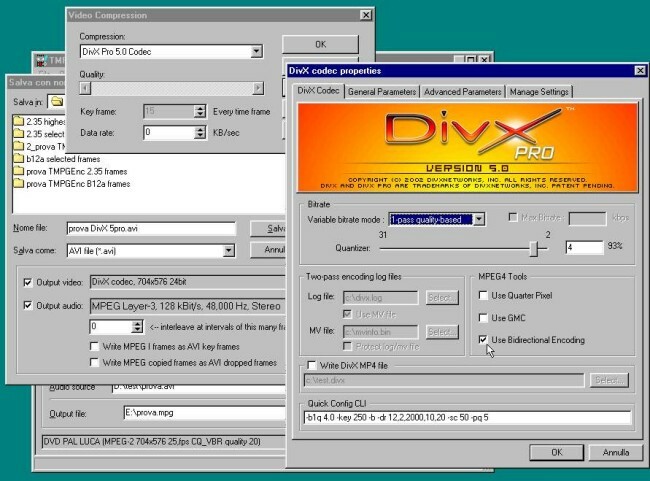 DivX 5.0pro encoding is fast and gives a small data movie (only 2,31MB in comparison with 6,96MB of MPEG2 ) especially if used with MPEG Layer3 audio more compressed than MPEG Layer2 audio used for MPEG2 files . The DivX 5.0pro compressed movie plays fine thanks to my ATLHON 1400mhz TB, but I've got many problems playing that with my older computer equipped with ATLHON 650 slot A , and playing is impossile with my oldest K6/2 450mhz computer even if DivX decoder quality is set to ZERO!!!!!!!!!!!!!! !So keep in mind that DivX 5.0pro needs more CPU power than MPEG2.Maybe older computer could play fine DivX 5.0pro files if equipped with the Realmagic X-card , a pci card able to play MPEG1 MPEG2 MPEG4 and DivX (from version 4.02 to the newest version) (www. sigmadesigns.com). 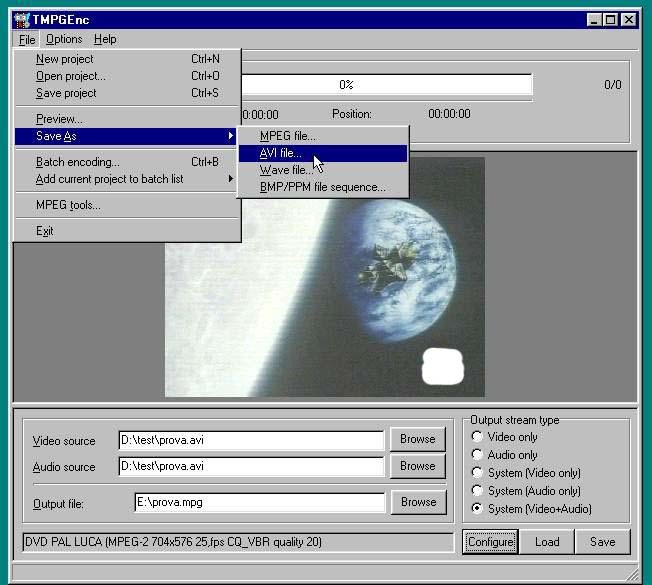 If you like encoding MPEG2 movies and your are plannyng to use TMPGEnc newest version, be sure you like produced movies.If you are not sure , take care old B12a version that is my favorite.Use TMPGEnc to encode MPEG2 files for your favorite movies , and to encode DivX 5.0pro files for less important movies.